Small and medium-sized enterprises are particularly vulnerable to the effect of severe weather incidents. Forty percent of them don’t reopen after natural disasters. Of those that do, only 29 percent remain operational two years later. 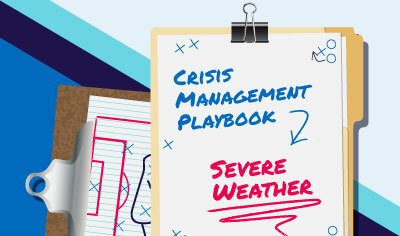 To keep staff and customers safe and your business solvent, companies need robust, severe weather emergency planning. Not sure how to get started? Or looking to take your current planning efforts to the next level? We’re here to help. Based on best practices in the field, our step-by-step, how-to guide gives you a detailed template to develop your own plan.